From the mannerisms to the disapproving glances, Louie based the character on Ora Zella. So when he won an Emmy for the role, he got up on stage and shouted, "Mom, we did it!" 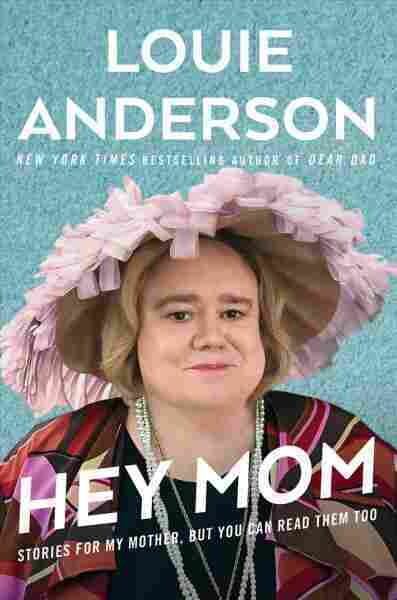 Anderson's new book is a tribute to his mom, who raised a huge family in poverty in Minnesota. Fiercely motherly, fiercely loyal to her children, you know, she was a know-it-all. When you have 11 kids — my mom had 11 kids — so if you have 11 children, you have to become a know-it-all, 'cause there's 11 people asking you. Or you make it up. And you have to make things that seem dumb, beautiful. You know, that's who my mom was. She could make really beautiful things. I reference that in the book; she could make tiny little things unbelievably beautiful. The vegetables, for instance. When she would cut the vegetables up, it was a serenade to the vegetables: "I love clean celery, Louie," "Hey, Louie, will you peel me a cuke? I just love cucumbers." And then, "Louie, get the little salt dips out for the radishes, so that we can dip the radishes. You know they do that at the White House." But it was just to make us ... feel better, or know what was possible. I don't know. I think she might've been a rich kid. I think, I knew that she probably lived pretty good and very proper as a little kid. And then she met my dad, and it was all down hill from there. I've always talked to my mom ever since she died. I'd go, "Hey Mom, what's going on? Are you up there with Dad? Are you with my other brothers and sisters who passed on? Hey, what a day I've had." Or, you know, I've always had that voice, that narrative. I think we all have narratives of somebody that we like to talk to. When he didn't drink, [my dad] was a decent human being, but still a very tortured human being. And when he did, he was the dragons from Game of Thrones. He was very vicious, and you never knew if he was going to breathe fire on you or not. My mom and dad grew up in this era where you didn't take off from your husband when you had 11 kids. Where are you gonna go in the '50s? Where is she gonna go? What is she gonna do? 'Cause you know what my dad always did? He worked — one or two jobs, no matter how drunk he got. I'm always on the verge of tears because I think everyday, you know, you should bring yourself to tears. Everyday you should be that passionate, and you should have a good laugh everyday. We never really learn how to deal with a loss. We just keep stuffing it down and make up for it in unhealthy ways a lot of times. And so, I don't think in this society we mourn enough. You know, that process of the funeral is always amazing to me: Get 'em in the casket, get 'em in the ground. You're busy, but you've got to grieve the loss. That's why people are at work, and they're crying. I'm always on the verge of tears because I think everyday, you know, you should bring yourself to tears. Everyday you should be that passionate, and you should have a good laugh everyday. And you know, you should discover something new everyday. I don't feel bad about crying or being emotional. I think it keeps me healthier. Danny Hajek and Shannon Rhoades produced and edited this interview for broadcast. Sydnee Monday and Petra Mayer adapted it for the Web.